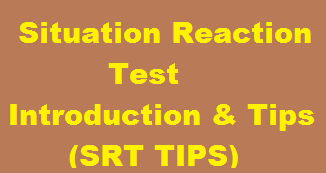 Browsing Category "SRT tips for SSB"
Previously i have uploaded various posts on Situation Reaction Test in SSB, you may read the basic introduction and Tips and SRT Practice sets 4 in my previous post. This post consists of more Situations with answers that are asked in Psychological Test in SSB. you can also download the SRT pdf from the link below. Ans. Immediately, open down he salient issues, addresses all the problems systematically and explains the action being implemented to the members. Ans. Accepts the change of role performs equally well and makes the programme a success. Ans. Professional expertise, honesty, integrity and coupled with well being of the humanity. Ans. Donates 45 percent towards taxation, 10 percent to the poor and needy, 20 percent for self education, 15 percent for brothers and sister, and distributions the remainder 10 percent for parents in case of emergency. Ans. Enjoys the company, alerts the emergency number, helps relieve both to safety and security. Ans. Does introspection, improved his shortcomings, put in sustained efforts, applies again and qualifies in the Service Selection Board. Ans. Took responsibility of his sister, gave all possible help to her family, and providing the safety and security in the longer run. Ans. Accept it as a normal course, watches an alternative movie, and views it again when shown in near future. Ans. Apologizes to the invigilator, explain his reason of coming late, seeks permission and takes the examination. Ans. Convince his friend, to maintain healthy environment for progress and prosperity, and ensure that his friend does not continue in the bad company. Ans. Read books, magazines, periodicals, newspapers, play games and sports attends adventure activities, joins social organization to help the poor and the needy. Ans. Feels that the same can be given to orphanage or poor people, since he always enjoyed good meals. Ans. Evaluates his friend’s observation improves himself an ensures that he does not give any chance to his friend to complain again. Ans. Give his point of view more convincingly, satisfies the audience and wins over the discussion. Ans. Takes help of his father in finding solution to the problem and exchanges with the teacher positively. Ans. Waited for some time for the river to settle took alternative means like a boat and reached his home in time. Ans. Jumps into the river take the son to the bank of the river and ensure the security of the child. Ans. Study in a new school, make new friends and learn more about the place and people.